Most people never think of Kansas as having waterfalls. In fact many of the waterfalls on this page have no signs or anything to to let the public know they exist. Here are a few of the Kansas waterfalls that I have found so far. I debated including the waterfalls that were created by man, but decided that if they didn't count, neither would Kansas' many beautiful man made lakes. This Kansas Waterfall page has grown thanks to people like you telling me where they have found waterfalls. Please email me with directions to other waterfalls. 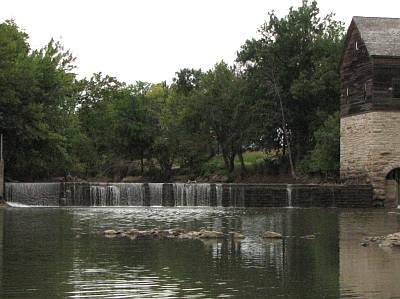 Abilene, Kansas - Lovely Brown Park Waterfall was created by a mill dam on Turkey Creek, a couple of miles south of Abilene, Kansas. It is located in Brown Memorial Park on land originally donated by Cleyson L. Brown, who founded the company which evolved into the Sprint Corporation. 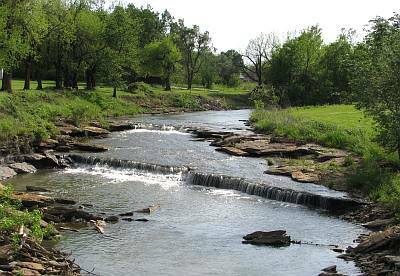 Altoona, Kansas - One of our more recent discoveries, Altoona Mill Falls, is on the Verdigris River, south of Kansas Highway 47. Very little of the flour mill, which was built in the early 1870s, remain. To reach this falls, go to the west end of 7th street and walk west across the field, about 200 feet. You will hear the waterfall as soon as you get out of your car. Beloit, Kansas - Beloit Falls on the Solomon River is just above Highway 14 near downtown Beloit. The falls is on the edge of Chautauqua Park, a nice little municipal park wedged in a horseshoe formed by the Solomon River. Blue Rapids, Kansas - Alcove Spring and Waterfall are located near Independence Crossing, a famous ford where pioneer wagons following the Oregon Trail forded the Big Blue River. The spring is productive all year around, but it also is fed by a small seasonal waterfall from snow and other runoff. Caldwell, Kansas - Drury Dam Waterfall is an overflow falls formed by the 1883 Chikaskia River dam. Drury is an unincorporated community 6 miles east of Caldwell. Cedar Vale, Kansas - Ozro Falls: This shallow waterfall on the Caney River was almost lost in the high water when this photo was taken, but is is actually a 3' drop. The road makes a low water crossing just above the falls. Ozro Falls is about 5 miles southeast of Cedar Vale. Don't approach the falls by way of Eagle Road and the Ozro Falls Cemetery, the road becomes impassible just past the cemetery. Instead, take Road 6 south from Frontier Road. Road 6 also deteriorates until it becomes a muddy two rut through a wheat field. I drove all the way to the waterfall on my first visit, but recommend walking across the wheat field. It could be a long walk if you get stuck. Chetopa, Kansas - Cherry Creek Falls is a low water crossing a few miles southeast of Oswego, Kansas on Clem Road. Cottonwood Falls, Kansas - Chase Lake Falls: The three waterfalls along the Chase State Fishing Lake spillway are among the most beautiful in Kansas. They have a total vertical drop of about 40' in perhaps 100' along the creek. The middle falls (shown here at right) is the most impressive and can be seen from below if you cross to the middle of the spillway, just above the lowest falls. Some people refer to Chase Lake Falls as Prather Creek Falls. Cottonwood Falls, Kansas - Cottonwood River Dam Waterfall: The falls and bridge at the north side of Cottonwood Falls is a nice place for a short break or picnic. The first dam at this site was constructed of cottonwood logs in 1860. It provided water power for a saw and grist mill. In 1906 the dam was expanded and used to generate electricity. The present dam is constructed from cut limestone which was later covered with concrete. Dexter, Kansas - Cowley Lake Waterfall: The dramatic 25' Waterfall at Cowley State Fishing Lake is less than 1/4 mile off US Highway 166. Dunlap, Kansas - Lake Kahola Waterfall: One of the most beautiful waterfalls in Kansas was created by the damming of Lake Kahola, southwest of Dunlap. Lake Kahola Waterfall is formed by the spillway, just north of the dam and east of the bridge & lake. The signs in the area leading to the dam are confusing, but it is worth the effort to find. The falls were handsome when this photo was taken in March and are much more impressive following Spring rains. The Lake Kahola spillway is a popular place for geology students, since it is easy to see several layers of limestone. The falls itself is formed by the "middle" limestone within the Eskridge Shale and blocks of Cottonwood Limestone rest on top of the Lake Kahola falls. Edgerton, Kansas - Santa Fe Lake Falls is located only about 40 feet south of Sunflower Road near the Edgerton city limits. The manmade waterfall is quite attractive in the spring or following heavy rain. Elk Falls, Kansas - Elk Falls: The Falls this community is named after is at the edge of town, just upriver from the 1893 Iron Truss Bridge. El Dorado, Kansas - Walnut River Falls is in Riverside Park on the east side of El Dorado. During low water period, water flows over just a tiny portion of the old dam, but there is much more water water a heavy rain. A pedestrian bridge crosses the Walnut River just above the dam and connects the park to a 5 mile hike and bike trail. Elsmore, Kansas - Bourbon Lake Falls: This waterfall in the spillway at Bourbon State Fishing Lake is usually active from April through June. After heavy rain, it is nothing short of spectacular. The 30' falls was visible through the trees from the gravel road a quarter mile away. While there is a path that 4x4s can use to pull up near the falls, it cannot be used by cars. If you park on the road, it is only about a hundred yards to the falls. The best time to visit is April until early June. Emporia, Kansas - Soden's Dam Falls: The Cottonwood River falling over the old Soden's mill dam is almost perfectly framed by the 1923 Marsh Arch Bridge. The adjacent Soden's Grove Park leads to the small David Traylor Zoo. Erie, Kansas - The Erie Mill Dam Falls south of Erie was constructed in the early 1870w. 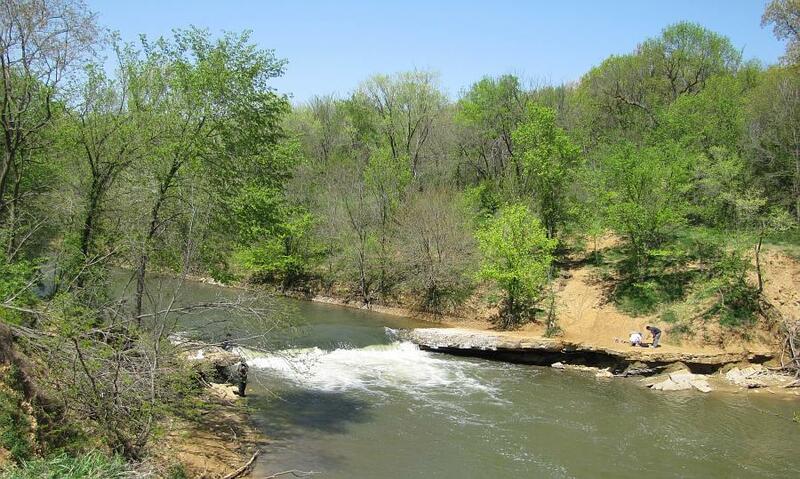 The dam is just below the Old 59 Neosho River Bridge, portions of which may date to the same period. Eudora, Kansas - Captain Creek Falls is located south of Eudora on Captain Creek near the the Johnson County and Douglas County lines. The Creek crosses under East 2400 Road (AKA County Line Road) just north of North 700 Road. The falls is downstream (east) about 300 yards. Be sure to wear shoes that you don't mind getting wet. Eureka, Kansas - During high water, the waterfall at Eureka Lake, north of Eureka, is one of the most impressive in the state. So far, I have only been able to visit the falls when there was just a trickle of water. Eureka Lake Falls is a few hundred feet down Bachelor Creek, which is fed by the the spillway from 259 acre Eureka City Lake. Eureka, Kansas - Fall River Falls is just north of US Highway 54 on the west side of Eureka. This photo was taken in September when the water going over the falls was about a low as it gets. During high water in the spring, the drop can largely disappear. Fort Scott, Kansas - Rock Creek Lake Waterfall is actually a series of three waterfalls created by the outflow from Rock Creek Lake, 3 miles west of Fort Scott. This is one of the few such waterfalls that has water flow almost year around. Fredonia, Kansas - Otto's Mill Falls: This lovely old linseed oil mill and dam is on the Fall River. Take Mill Dam Road (1000 Road) west to the Fall River. The last part of the road leading to the mill is rocky and rough and I recommend parking and walking the last hundred yards. Otto's Mill was originally built in 1891, burned in 1898, and was rebuilt in 1900. Halstead, Kansas - The Little Arkansas River passes through Riverside Park in Halstead, with a falls and a swinging suspension bridge. The park appears in the 1955 movie, Picnic, staring William Holden, Rosalind Russell and Kim Novak. 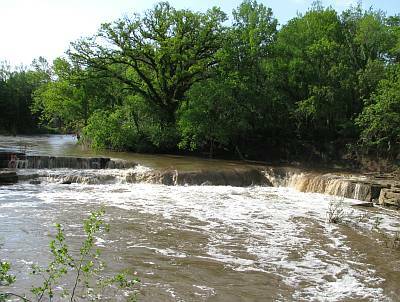 Hoyt, Kansas - Rocky Ford Waterfall on Soldier Creek is on the land of the Prairie Band Potawatomi Nation. The small waterfall is in a nice peaceful location, but didn't photograph very well - in part because of a large dead tree which covered one end of the falls when these photos were taken in the fall of 2010. Junction City, Kansas: Geary Lake Falls is one of the most beautiful waterfalls in Kansas. It is formed by the outlet from Geary State Fishing Lake and is only active in the spring or after a heavy rain. Getting down below the falls for a better view isn't easy walking, but it is worth the effort. Lawrence, Kansas - Bowersock Dam Waterfall: Bowersock Dam near downtown Lawrence can form a pretty spectacular man made waterfall during high water. Bowersock Dam Waterfall also keeps this section of the Kansas River open throughout the winter and during cold weather, particularly in January and February. This stretch of open water attracts eagles searching for easy prey. At times you may be able to get with 100 feet of bald eagles. The best time to see bald eagles is when most other area ponds, rivers and lakes are iced over. Lawrence, Kansas - Wakarusa River Falls is in the spillway leading from Clinton Lake on the east side of Lawrence. he spillway has water year around, but the amount of water being released varies greatly. It was quite attractive the day that this photo was taken and there were many people playing or fishing nearby. You can approach the falls from the north or south, just off of East 902 Road. Lincoln, Kansas - We found out about this Saline River Waterfall from a photograph on the wall of the Hungry Hunter restaurant in Lincoln. We learned that it is located just south of town. It is visible from Highway 14 from the bridge over the Saline River. 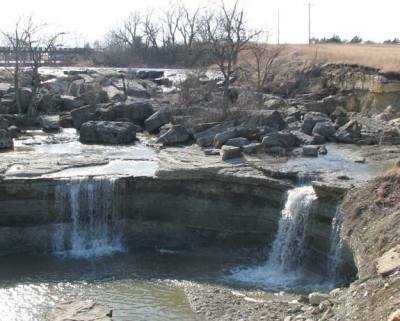 Longton, Kansas - Flint Road Falls is a lovely natural falls located on Hitchen Creek just north of Flint Road (County 366 Road), 2.6 miles west of Longton Cemetery. This photo was taken from the bridge over Hitchen Creek. Longton, Kansas - Longton Dam Falls is located on the south side of Longton on the Elk River. To visit the falls, drive to the water plant at the south end of Delaware Street and walk south to the river. The two rut leading to the water is very muddy in wet weather. It is hard to get down to the river edge. 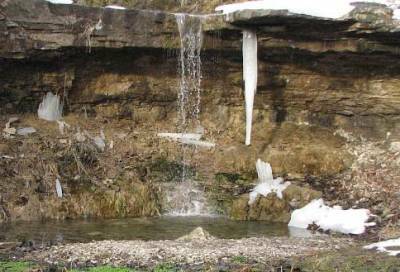 Manhattan, Kansas - Deep Creek Waterfall: One of the best kept secrets in Kansas is the Deep Creek Waterfall at Pillsbury Crossing Wildlife Area. This beautiful 60 feet long, 5 feet high waterfall should get a lot more year around attention. There is no place nicer than sitting on a rock near the base of Deep Creek Waterfall on a sunny Spring day. Pillsbury Crossing is a low water river crossing where vehicles following Pillsbury Crossing Lane drive a 100' stretch through a few inches of running water. The Falls are just a few dozen feet down river from the crossing. Manhattan, Kansas - Rocky Ford Waterfall is created by an overflow dam on the Blue River about 3/4 of a mile below the Tuttle Creek Dam. Tuttle Creek Reservoir is the second largest impoundment in Kansas with 12,500 acres of water and approximately 100 miles of wooded shoreline. Marion County, Kansas - Elm Springs feeds a small creek which has a 30' waterfall in far northwest Marion County, Kansas. The spot is overgrown and heavily shaded. The most interesting thing was the many snakes in the pool of water at the base of the falls. Local legend is that cowboys would use the falls to take a shower. Marion, Kansas - Central Park Spring is a natural spring which has been used since the first three families arrived in 1860. The flood on 1951 diverted the nearby creek and the spring fell into disrepair for many years but was restored in 2001. Marquette, Kansas - Kanopolis Lake Waterfall is located in the spillway from Kanopolis Lake. The dam impounds the Smoky Hill River and was completed in 1948 as a flood control and water conservation project of the United States Army Corps of Engineers. Merriam, Kansas - Turkey Creek Waterfall: Waterfall Park in Merriam, Kansas was created in just the last three years and work is still being done to Waterfall Park and the adjacent Turkey Creek Streamway Park with a 3.5 mile bicycle trail. It is a lovely spot, despite being wedged in between I-35, railroad tracks, and an industrial area. Minneapolis, Kansas - Markley Dam Waterfall: The Solomon River in Minneapolis was dammed for the Jackman Roller Mills in the 1800s. Markley Dam can be seen to the west from the K-106 (Mill Street) Bridge. 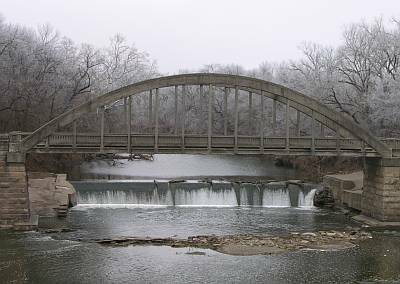 Moline, Kansas - Wildcat Creek Waterfalls: The oldest hanging pedestrian bridge in Kansas is located in Moline These two short waterfalls are just upstream from the 1904 suspension bridge. 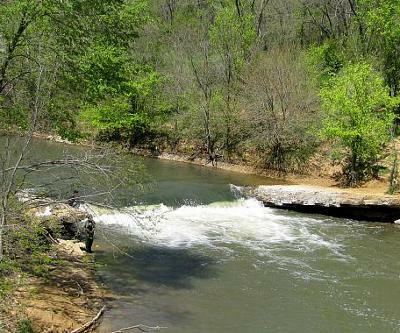 Neosho Falls, Kansas - Neosho Falls Waterfall is quite attractive and a popular spot for fishing during low water. Neosho Falls Waterfall is adjacent to Riverside Park which has a playground and camping with showers & utility hook ups. The surrounding community is sometimes listed as a ghost town and there are many interesting overgrown abandoned buildings. Olathe, Kansas - Cedar Creek Falls is formed by an overflow dam on Cedar Creek in southwest Olathe, just above Lake Olathe. There is a flow of water year around, but Cedar Creek Falls is most impressive in the spring or after a heavy rain. Lake Olathe is a 170 acre lake surrounded by a 208 acre community park dedicated in 1959. Olathe, Kansas - Cedar Lake Falls is located in the spillway just below the Cedar Lake dam in Olathe. Cedar Lake is a 75 acre lake surrounded by a 54 acre community park which was originally dedicated in 1920. Osawatomie, Kansas - The 1930 Creamery Bridge is a Maple Arch bridge which has a rainbow span 140 feet above the Marais des Cygnes River at its highest point. Osawatomie Dam Falls is just 60 yards away. Oswego, Kansas - Riverside Park in Oswego, Kansas is a 90 acre park along a bluff which overlooks the Neosho River Falls over an overflow dam. The historic Neosho Crossing for "the old Indian trail" between Missouri and the Osage buffalo hunting grounds in central Oklahoma crossed the river above the present dam and falls. Riverton, Kansas - The Empire Power Dam Falls is the most impressive water feature that I have found in Kansas to date. The power, the sound, the experience of standing on the Highway 107 bridge and seeing the waterfall over the dam extend for a quarter mile combine to create a special experience. 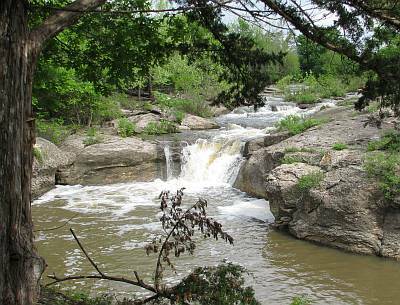 Salina, Kansas - Indian Rock Park in Salina, Kansas has two sets of waterfalls on the Smoky Hill River. This stretch of the river and the falls are easy to miss, as the river passes between 30' tall cliffs. The Upper Smoky Hill River Falls is about a 4' drop, but the lower falls is semi horseshoe shaped and a more impressive drop. Sedan, Kansas - Butcher Falls on the 8,000 acre the Red Buffalo Ranch is one of the most beautiful waterfalls in Kansas. The rock lined river basin is the perfect setting for this waterfall. 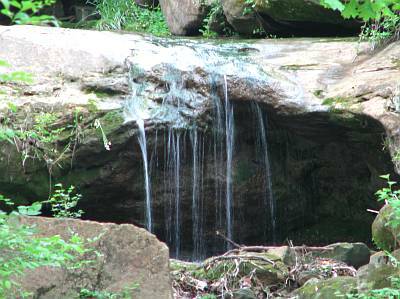 Sedan, Kansas - Hollow Waterfall: The little waterfall at The Hollow Park is right off the main street in Sedan. The attractive small park includes a boardwalk that goes up the creek and culminates at the waterfall. Waterville, Kansas - There are two waterfalls in the spillway that leads from Lake Idlewild to the nearby Little Blue River. There are no trails to Idlewild Falls and you will need to follow the sound of the falling water about 70 feet through fairly heavy brush (including some poison ivy) and possibly some standing pools of water. Be sure to dress accordingly. The two waterfalls are only about 60 feet apart and each have a drop of 10-12 feet. Wichita, Kansas - When the 1970 Lincoln Street Dam and Bridge across the Big Arkansas River near downtown Wichita were reconstructed, the layout was changed so that the dam was no longer beneath the bridge and the new attractive dam included an attractive fish ladder and kayak run. 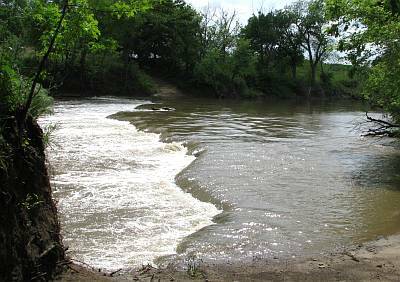 Winfield, Kansas - The Tunnel Mill Dam in Winfield creates an attractive overflow waterfall with a steady flow over the falls and a little rapids about 50 yards below the dam.